DrunkenWasps.com - Time for Wasps to take an axe to the tomahawk chop! Round one is done and dusted, and what have we learnt so far this season? Well the tough assignment at Sixways definitely lived up to its billing! Worcester are most people’s favourites for the drop to the Championship, but no team coached by Alan Solomon’s are going to simply hang up their gum shields and walk quietly into the night, and so it proved. They were passionate, tenacious and powerful, we were simply hanging on before the team led by the indefatigable Launchbury and guided by the young and developing Searle established our game plan, with the bench changing the momentum to squeak, and I do mean squeak the win. A slight miscalculation by Dougie Weir when executing his attempted match winning drop goal separating us from the stolen 4 point haul, when to be fair a 1 point losing bonus point would have been fair reward. Yet perspective is needed and a larger game is afoot, with the narrative being that all teams carry the ghosts of poor matches past hidden in their closets, however those that win titles have a little sign hanging above these spectres, with a simple ‘W’ etched on its surface, not all points gathered are deserved, some are stolen with the level of audacity that an MP enjoys when submitting their expense accounts. But let us make no bones about it, all are essential if you want to lift a trophy above your head come seasons end. 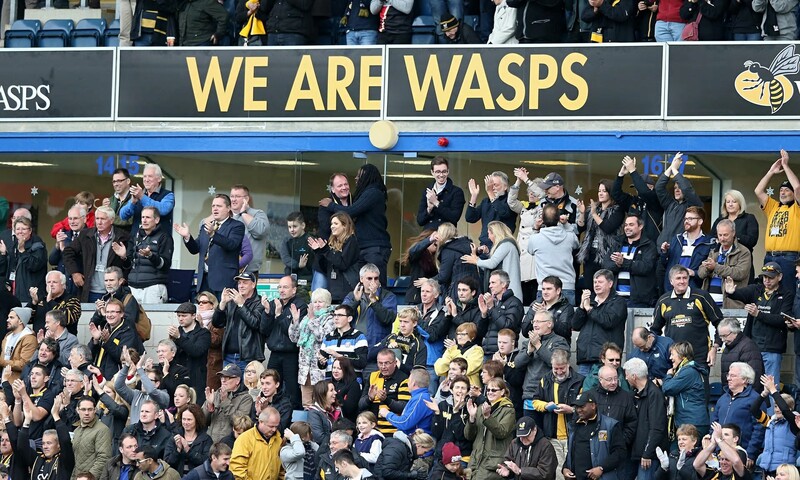 Now a new challenge lies ahead, we return to the Wasps nest for our opening home game of the 2018/2019 season, opening our doors and inviting in the hoards from the west country, who will arrive headwear adorned, tomahawks risen in preparation of battle and throats ready to roar on their charges towards another premiership final. This is no flight of fancy, Exeter are a force in the premiership with 1 title already secured, and frustration writ large across their collective psyche after their defeat and loss of their crown to the wolf pack at HQ only a few months previously. Whatever your individual thoughts are regarding Exeter’s appropriation of the Native American culture, which in itself has inspired discussion these last 2 years, what you cannot ignore is that since the near 20 year history of being termed the ‘Exeter Chiefs’ this is a club that has carved its own identity, has enriched the premiership no end with its players, coaches, backroom staff and support, and has one of the most respected Directors of Rugby in the modern game with Rob Baxter. They proudly have a 60% win ratio in all of their premiership games winning 109 of their 183 arm wrestles to date. This is an impressive return from the only profit making club in the premiership, and for us Waspies the reading becomes that much more unpalatable, showing a record harder to swallow than a Brussel sprout on Christmas day, with only a paltry 5 wins for and 12 losses against since the Chiefs entered the top table. So what conclusion can we draw from such damming stat and history to work against? I am not going to sugar coat the next part, as it would be like trying to soften a blow from Frank Bruno by placing a pillow in front of your face, we are heavy underdogs this week. Chiefs have the luxury of a settled squad and style, yes, they are always perceived as more than the sum of their parts, however when those parts include Simmonds, Cowan-Dickie, Whitten, Steenson, Cordero, Slade, Kevisic, White, Hepburn, Yeandle and Armand to name but a few that is one strong and impressive set of cogs powering the Exeter engine! We cannot deny that we have quality throughout, with Wade, Daly, Robson, Launchbury, Carr, Johnson, Hughes, the impressive and rapidly improving Cruise, Zahvhania, Brookes and Taylor, coupled with the chance of Sopoanga and Brad Shields making their debuts. However, and this is the rub, as talented as they are we have too many variables, to little time together as a unit and a lot of collective coherence to nurture. There is no doubt about it, as we develop we can once again this year be title contenders, but at this moment where do you place your money? Is it Exeter with the power of a Dodge Challenger and reliability of a Volkswagon or Audi, or ourselves with the speed and styling of a Aston Martin, yet with the unknown element akin to Vettel in charge of a F1 Ferrari? What I would give for some Vorsprung durch Technik! One thing is for certain however, we will not win anything by giving them possession! Baxter has already stated that his is a team that demands 75% possession as a minimum. They love the contact, the phase after phase after phase. They understand the need to win the inches more than most other teams, and by George they are good at it! They will pummel and pulverise the defensive line until submission is gained and dominance achieved either through tries scored, penalties won or points kicked, and they will go for the full 80. Do not believe they will fall away as they do prove the old rugby adage that defence is harder then attack - 66% of possession, 95% of rucks won with 216 total passes and 180 runs, whilst only kicking 17 times and giving up a paltry 8 penalties during their demolition of Leicester last week is damning evidence of what is coming our way. Remember last seasons opening gambit at Sandy Park? Possession gained, 20+ phases attacking our gain line and a converted try achieved. Give them possession and give up hard earnt ball and they will win, it really is that simple. This is not a time to circle the Wagons, this is a time to knock those flimsy fabric covered wild western transports over and come out with rifles blazing. We must get and keep possession, we must fire the shots and ask the questions, if we wait for them to make the first foray then another ghost will be placed in our playing closet, with its sign simply saying ‘L’. Re: Time for Wasps to take an axe to the tomahawk chop! Have to agree with most of what you say, would like to have played them after 4/5 games into the season and with WLR back into the team. Good review. I'm nervous as hell about this game following the weekends results. You would hope that we can give a better account of ourselves than Tigers who looked utterly bereft or ideas last weekend although when the Chief's defence has knocked you backwards time after time it gets pretty demoralising, let's be honest, we've been on the receiving end ourselves down there on several occasions. You would hope that Dai will have studied the Premiership final, Sarries dismantled Chiefs game brilliantly, hat's off to their coaching team. It exposed Chiefs lack of a plan B completely. However that would mean having to play as well as Sarries did that afternoon which is no easy task. If our new arrivals had been bedded in for a few months I might be more confident but we looked very much like a new team last weekend so it's going to be a very big ask. Not impossible by any means and we have our part to play to really get behind the team. This is definitely not a must win game, it is a must LEARN game. A lot of our guys have not been together long and must gel before we can really expect to beat the Chiefs. However, we must try to stay in the game and see how they approach it. We need to use coaching intelligence plus full intensity to beat these guys like we used to do to others in 2000-2010 era. They are not unbeatable by any means. Great read .... thanks Chris! A good read, thank you from a visiting Chiefs Supporter. Very complimentary. Good luck this weekend looking forward to a good game as we have had with you in the past. Cheers. Shields to start. Lima off the bench. Nemo out for probably two weeks. YY still not ready. So Atkinson to start again? - hope that he can do what's required. Game management crucial. Is Searle up to it? !0/12 axis has to be much better than last week. Backs need the ball in space. We have to match them in the tight and the lineout. And keep moving their tight forwards around. As said, it's not do or die second game in, but the manner of our performance matters - demonstrate more cohesiveness. I think the issue for me is we have shown we can score lots of tries against them in the past, but we have to click. The unfavourable record we have in the last three seasons is partly explained by our often weakened selections when we play them, especially away, but their game plan can be kryptonite to ours. After a few games we start to click, but early in the season a "moving parts" game is harder to get going than the Chiefs' more simple grinding, possession based gameplan. In many ways Chiefs remind me of Saints circa 2012, very strong basics and set piece, plenty of possession and always turning us over whilst we played all the attractive stuff. Saints tended to get beaten by bigger Euro teams that could match them in the basics, I think Chiefs are going that way, none if which helps us. A very young and inexperienced ref so wonder how that will affect the breakdown - Chiefs are very streetwise in that area. The way the breakdown will be reffed is a key element. But it is also our approach to it that will dictate the ebb and flow of this game. There is absolutely no point in not contesting the ruck and simply standing back whilst spreading the defensive line, Chiefs will love this and simply go through the phases with one out runners hitting the gain line at pace time and time again. If we are to have a sniff we need to chop players down and then have a player willing to jackle immediately, Chiefs do a grand job of having support players ready to assist the tackled player, however contest this area hard and you start to disrupt and slow down ball, they in turn may start populating the ruck with extra players to secure ruck ball, this reducing their one out options. They do have a good setof backs, but nullify their game plan at source (the ruck) and we have a chance. I would also hope we have been looking at playing the long game as well, not be afraid to spend large amounts of time ball in hand, and will reduce our kicks to going for territory, or if we go for a box, to have a hard chase and compete for the ball, not to simply slap it backwards, but to jump and catch, the chasers need bravery here, as they will be airbourne and likley be tackled on landing, but we must win ball. Any loose box kicks, slapping balls backwards or hoofing it downfield is candy to Exeter. Saturday will show whether we have the confidence to do this as our recent games have showed a lack of tactical nouse when dealing with their threats and game plan. Yup I have just watched the Ex v Tigs game quite carefully. Exeter are just incredible at keeping possession. It doesn't matter if it is a forward or a back they are so precise and patient, other teams knock on or mess up after 6-7 phases, these guys can go for 30 !. If they hit contact the guys are always there to clear out and keep possession. If they go backwards they just start again until they find a weak shoulder or a gap. Wombles is spot on, we need to attack the breakdown or we will have to defend for 70% of the time and eventually any team will crack. NO aimless kicking at all.